Mount Hutt is the most developed ski area in Canterbury. The resort caters for skiers of all levels, with good intermediate and advanced runs, and a 'magic carpet' lift for beginners. There are also some excellent off-piste areas, including a run through the Towers rock formations at the top of the mountain. One of the main disadvantages of Mount Hutt is its location on a very windy section of mountains in New Zealand. The ski area is forced to shut down roughly 14 days per season due to dangerous winds. The drive to Mount Hutt is also rough, so most drivers unaccustomed to mountain and snow driving take the shuttles from Methven. 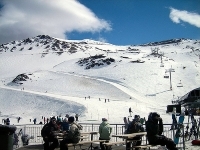 The ski season in Canterbury lasts from June to October. There is no accommodation on the mountain, and most skiers stay in the small town of Methven, which has a few bars, cafes and restaurants. The larger towns of Hanmer Springs, Ashburton and Christchurch are all about an hour's drive from the mountain.